VINTAGE HAWAIIAN SHIRT Vertical Floral MADE in HAWAII Surfer with BOLD HIBISCUS Print Men's S! VINTAGE HAWAIIAN SHIRT Vertical Floral -= MADE in HAWAII =- Surfer Shirt with BOLD HIBISCUS Print Men's S! Please Click on the Arrows above to see Each Picture and then Click on each Picture for a larger view! 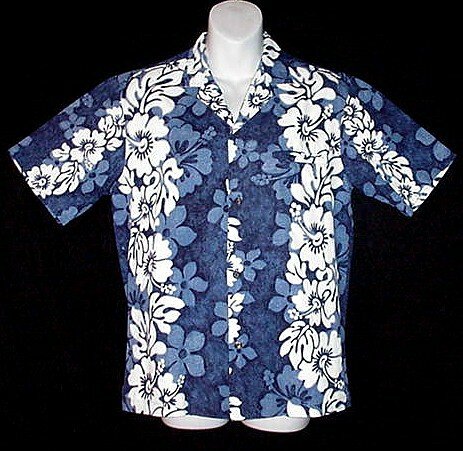 Aloha shirts look killer on men or women, worn open with a tank top underneath! Shirt: Shoulder seam to Shoulder seam straight across the top front 17 inches, Underarm to Underarm/Chest 42 inches around, Waist 41 inches around and Overall Length is 27 inches from the top center back neckline to the hemline! **Condition** In EXCELLENT Vintage Condition with no visible flaws at all to report! Packed away for several years, so you may wish to launder prior to wearing! I always combine shipping on multiple purchases as well! At Threads and Gurlz Gone Glam Lingerie Credit Cards are gladly accepted through our Direct Checkout... Cashier's checks and Money orders are gladly accepted as well! Thanks so much! Be sure to take a peek in the rest of the store for more vintage Hawaiian Shirts, Gunne Sax Gowns, Nostalgia Dresses, Angora, Mohair, Leather and Fur Boots, Designer Leather, Leopard and Lace! Your transaction is COMPLETELY ANONYMOUS... NO ONE can see what you've purchased, besides you and I, PERFECT for GIFT GIVING... and your package will always be carefully wrapped and shipped DISCREETLY with no indication what~so~ever of it's contents! HAWAIIAN SHIRT Silk Classic PINEAPPLES WOODY TAPA Tropical Floral Print ALOHA Men's Size XL! SUNNY FLORAL Drama DRAPE 60's Vintage Dress VLV HAWAIIAN HALTER Style CHIFFON Overlay SWEEP S-M! BURGUNDY WINE Vintage BOHO HIPPIE SKIRT Midi Length Tiered SWEEPING BOHEMIAN Beauty Sz S-M! TANGERINE DREAM Fairy Hippie VINTAGE Maxi DRESS Woodstock BOHEMIAN FLORAL LACE Long SWEEPING Sz M-L! HAWAIIAN SHIRT USA Quality PAUL FREDRICK Nordstrom's Bold BRILLIANT Floral Print ALOHA Men's Sz XL! RARE SURFER Vintage 50's HAWAIIAN Shirt CLASSIC ALOHA TIKI Tribal Floral Print COTTON VLV Size L! VLV VINTAGE 70s HAWAIIAN SHIRT Vertical Floral MADE in HAWAII with BOLD HIBISCUS Print Men's S! VINTAGE HAWAIIAN SHIRT VLV Tiki Hawaii ISLAND TRADITIONS Floral TRIBAL Print TAN WHITE Sz XL! AUTHENTIC RARE Vintage 60's HAWAIIAN Shirt AIKANE HAWAII Aloha AMAZING NEVER WORN Condition L-XL! FLORAL FAIRY VINTAGE Dress HIPPIE Maxi Gown ROMANTIC Fem Long POOFY POET Sleeves FLOOR LENGTH Sz-S!